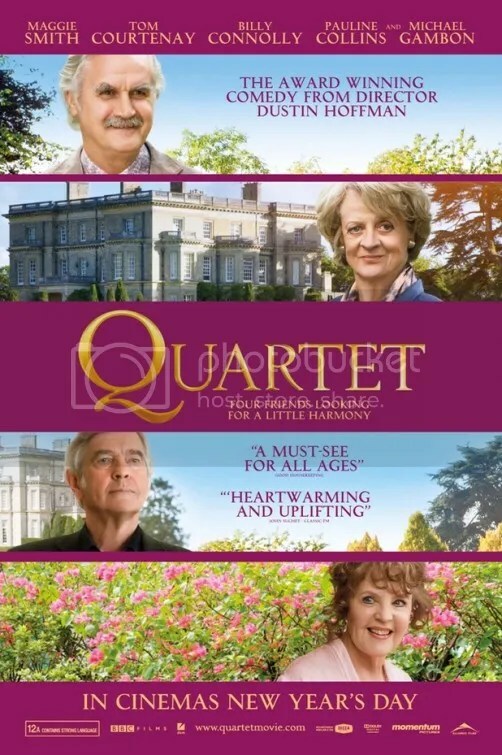 It’s virtually impossible not to discuss Quartet, without mentioning The Best Exotic Marigold Hotel. Director Dustin Hoffman’s (yes the actor) drama is an amiable lark about four aging opera singers in Beecham House, an old folks home for retired British musicians. It’s a pretty tony place with satin sheets and gorgeous vistas. Residents lounge around the opulent grounds while sipping tea and playing croquet. It’s a decidedly different view of old age from Michael Haneke’s Amour of the same year. This is sweet comfort food that doesn’t aim too high. It merely seeks to entertain with the charisma of our seasoned stars. There’s sophisticated but slightly gloomy Reggie (Tom Courtenay), sweet but slightly daffy Cissy (Pauline Collins) and cheeky but slightly oversexed Wilf (Billy Connolly). They actually sang together in a famous performance of Giuseppe Verdi’s “Rigoletto” a long time ago. They’ve been friends forever. But this is a quartet after all and thrust into their midst is new arrival Jean (Maggie Smith), the irritable old biddy who still carries the torch for our dear damaged Reggie. While I was watching Quartet I was charmed by the trifling observations and banter of our four main stars. I chuckled occasionally at the “I can’t believe an old person just said that” one-liners, mostly from Billy Connolly’s character. I’ll also single out Michael Gambon as kaftan-wearing Cedric who rules their impending musical production with an iron hand. He’s rather amusing. But days later as I reflect upon what I saw, I can barely remember any of it. Perhaps you have to be of the septuagenarian set or older to truly appreciate this. It certainly is gentle. Even Cissy’s encroaching senility is treated as a sweet personality quirk. If you’re looking for entertainment that doesn’t rock the boat and is content to simply be cute, then you should enjoy Quartet quite a bit. The company unquestionably elevates this material into something that’s worth your time. It’s an effervescent little piffle. Nothing wrong with that. Given the talent involved, I guess was hoping for something more. This entry was posted on January 25, 2013 at 8:00 pm and is filed under Comedy, Drama with tags 2012. You can follow any responses to this entry through the RSS 2.0 feed. You can leave a response, or trackback from your own site. I remember seeing Hoffman promote this on The Colbert Report. I think I might catch this one when it comes on Netflix. Nice review. Thanks. It’s definitely worth a rental. I must say I was waiting for this review haha. You know I love Dustin Hoffman (yes, even if he couldn’t save Kramer vs. Kramer 😉 ). He’s actually one of my favorite actors, particularly alongside Tom Cruise in Rain Man; at the very top of my towatch list are Tootsie (I know I know) and Marathon Man. To misquote Hoffman in that last movie, is HE safe, or as safe behind the camera as he is in front of it? I’m kind of curious, considering he has a good chance. After all, Meathead started with Spinal Tap, Robert Redford with Ordinary People; then there’s movies like Tom Hanks’s Larry Crowne and Madonna’s W.E. Hmm. I like your examples. I forgot that Tom Hanks directed the critically panned Larry Crowne, but his theatrical feature debut, That Thing You Do! was actually quite good. Regarding Quartet: To quote my friend Adam Gentry, “It’s surprising that Dustin Hoffman finally decided to take the plunge with THIS.” It’s pleasant enough, but nothing that would explain why Hoffman felt the call to direct. Yeah I keep forgetting about “That Thing You Do!” for some bizarre reason…. I’ve been a big fan of Dustin Hoffman ever since I saw him in Tootsie. I’ve seen his earlier films since, but I think that was the first for me. I enjoyed your review and I commented on it. Sorry to say, but this movie sort of bored me to tears. I liked the cast, but that was just about it. Good review Mark. I won’t defend it. It was boring in parts. I get that, but I somewhat enjoyed the fussiness of it all. No but I am constantly confusing the two. I will though as it has one of my favorite actors, Philip Seymour Hoffman in it. Yeah, I think I’ll see both but “A Late Quartet” seems more my style. Yup, Maggie Smith is pretty wonderful.